When invited at a snack potluck last week, I searched hours for various snack ideas but most of them seemed humdrum – at potlucks you want to take something unique because you like it when people appreciate, right? I knew some others were bringing cutlets, samosas, a baked dish, sandwiches, and Mexican pinwheels. Amid those, I thought the light snack Stuffed Khandvi from Gujarat (also known as Pittod in Rajasthan & Suralichi Vadi in Maharashtra) would be different (being the only item with chickpea flour). Basic Khandvi is made without any stuffing & still tastes & looks great, but I added a slight variation, and had everyone complimenting on how soft & good the Khandvi was. The preparation & cooking of Khandvi is so simple, everything can be done within 15 minutes – but those 15 minutes will be a roller coaster ride where you have to work super quick! 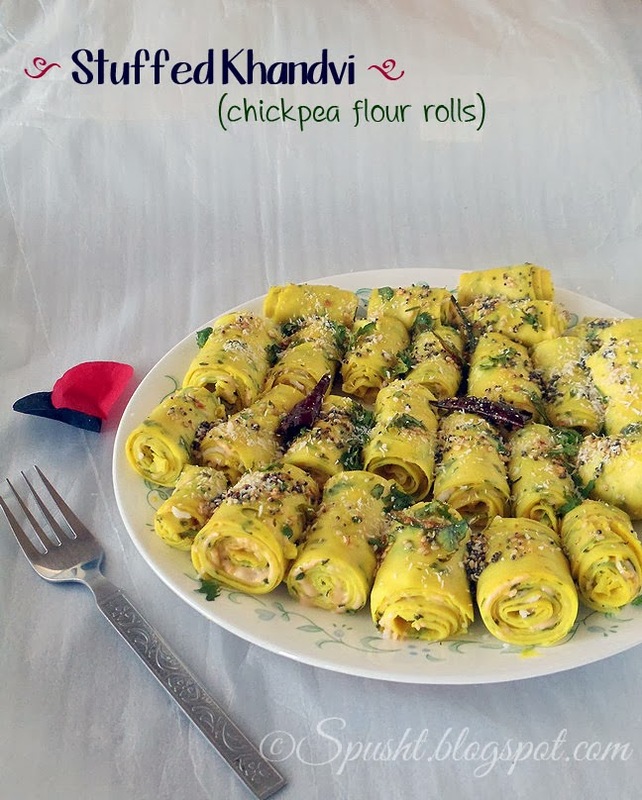 Here's the recipe for Stuffed Khandvi from Shobha Indani's cookbook Swad Sugandh that should be good for 4-6 persons. Combine besan + dahi + water + green chili paste + haldi + palak + salt + sugar in that order in a bowl. Whisk well until no lumps. It will be a very runny/watery batter. After that, very lightly[e] grease (with oil) the surface you will roll the khandvi on – you can use a) the back of large flat-bottomed steel dinner plates, b) aluminum foil sheets, or c) clean kitchen counter space. The proper besan : dahi : water ratio is half the battle if you want to get soft khandvis. The other half battle is to cook them till just enough. Pour the above batter in a heavy-bottom pan[f], cook on medium heat, stir continuously pressing & breaking any lumps (don’t leave it unattended even for a minute!) till it thickens & leaves the sides of the pan. As the khandvi mixture thickens, you want to test with a small amount to see if it’s ready instead of spreading out the entire mixture and realizing it’s not done! To test, take a small spoonful of mixture & spread a thin layer on the back of a small plate, blow over it to let it cool few seconds & try rolling it with wet fingers. 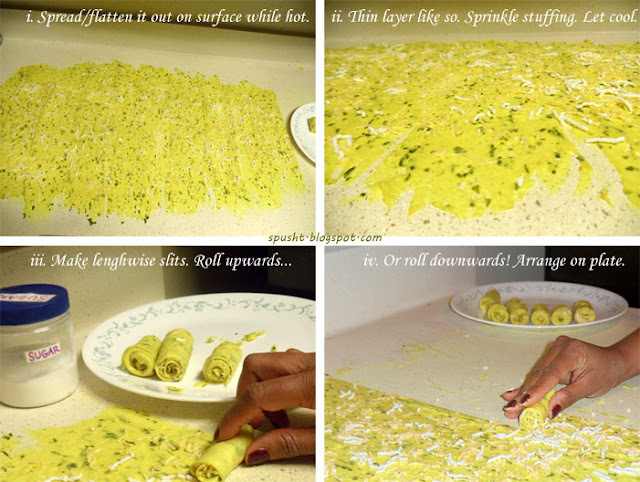 If the khandvi mixture: a) doesn’t roll, if it b) sticks to your fingers, or if it c) looks watery & spreads more on plate as you’re trying to roll – that means you have to continue cooking the mixture for some more time on low flame, stir continuously. Test again each minute to avoid over-cooking – if it thickens too much, it will be difficult to spread & you’ll probably have to make pieces of khandvi instead of awesome rolls. When it’s cooled down, sprinkle the stuffing mixture all over randomly (I don’t mix up the stuffing beforehand; I sprinkle each at a time but it’s your choice) & gently press them. Then using a knife/pizza wheel slicer/dough cutter cut the khandvi lengthwise & about 1-1½ inch wide strips. Once you finish the slits, with lightly wet fingers lift the edge of the strip it up or use a knife to lift it & gently (yet tightly) roll each strip with both hands’ support & place all of them together on a plate. In another small pan, heat oil, add mustard seeds, let them pop, add sesame seeds + asafoetida + green chillies + dry red chillies – as soon as they change color (don’t let sesame seeds burn!) 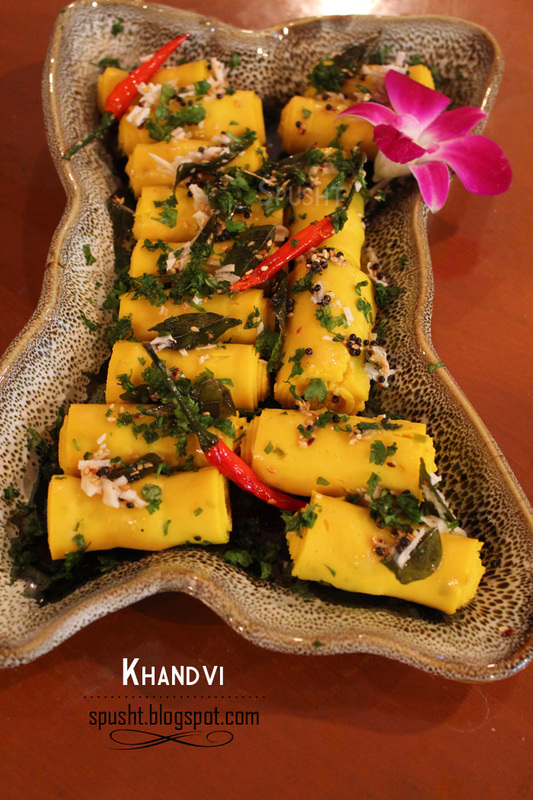 – using a spoon pour this hot oil with tempering over each khandvi roll. 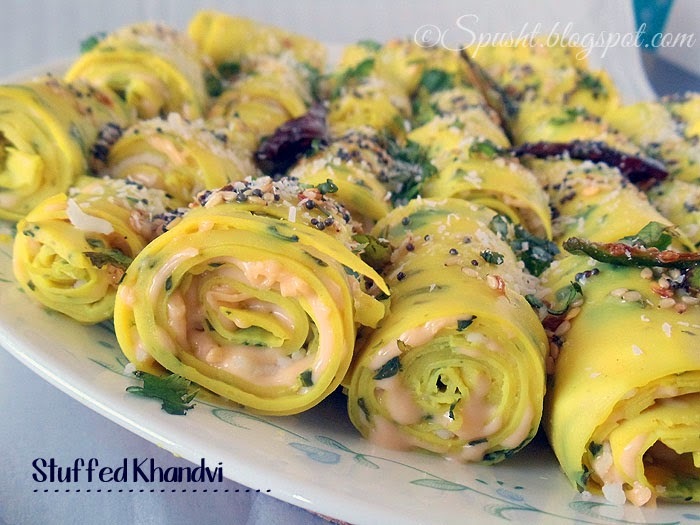 Sprinkle the coconut & cilantro over the khandvi rolls to garnish. Done. [a] I used homemade paneer; and since it was smooth instead of a thick store-bought slab, I added a pinch of salt & kneaded it well before grating. [b] If you place the curd outside fridge overnight, it will turn little sour & give a nice light tangy flavor to the Khandvi. Some people use buttermilk and/or lemon juice too instead, but I don’t know the proportions for those. [c] Mozzarella, parmesan, cheddar – whatever cheese, doesn’t matter. [d] If you use chopped green chilies instead of paste, the chilies won’t spread nicely & evenly in the mixture. Khandvi is supposed to be smooth without anything protruding out of it. I suggest using the paste (you can easily churn green chilies at home to make the paste). [e] You may skip the greasing part if your surface is smooth enough. I feel oiling the surface helps spread & roll better, provided you grease it very, very lightly. [f] Khandvi Blunder Alert # 1: When one time I let the pan heat up on medium heat & then added batter, it instantly started sticking to the bottom of pan, started browning & created lumps. So I suggest you do not switch on heat until you have poured the batter & are ready to start stirring. [g] I say that because when I don’t cover up some spaces, the Khandvi usually breaks in those parts during rolling & does not look even. Also I realize that usually leaving the edges a little thicker than the rest helps lift the edge of strip & roll better. One time when I made Khandvi, I thought of using ghee for tempering, I thought it will be healthier/richer/better Khandvi, and it was fine as long as it was warm. Once ghee cooled down, it looked bad in the solid form over each khandvi. So each time I had to heat up my Khandvi in microwave for 5 seconds before eating whereas it is supposed to be eaten at room temperature! Lesson learned: just use oil for the tempering. This is awesome recipe & must try!! Very nice recipe. Can you share how to spread this thin layer? What can you use to spread? And do you pour spoon by spoon or whole mixture at a time and then spread it? Put dollops of the mixture on surface then spread them vertically individually and connect. I spread with a spatula and sometimes with the flat steel turner (palta in Hindi) that I use to make paratha. Hey Nisha tried your recipe it turned out just perfect! !